April 17, 2008 – Warmzone recently donated ComfortTile radiant heat cables to the Colorado Parade of Homes. The radiant floor heating system was installed under tile floors in the master spa and coffee bar area of the luxury home, complementing the innovative design and elegance of the Bella Paradiso home. The custom home was built by Bartran Construction. Ceramic tile was used for much of the home’s flooring, which posed a significant challenge for the builders in terms of finding an efficient solution for heating the home. ComfortTile radiant floor heating cables proved to be the ideal solution for the spatial house, serving as an efficiently heat source while keeping the construction process simple and on schedule. The electric radiant floor heating system was installed quickly and easily, providing the tiled floor areas with comfortable, efficient heat. The Warmzone floor heating system also has a fast response time, resulting in instant, evenly heated floors. “What really surprised us was how easy the system was to install. The system went in flawlessly and without any setbacks. The installation instructions were clear and easy to read, and Warmzone’s tech support was so helpful in explaining and researching any questions that we had. As a large custom home, heating all of these areas was interesting, but once we hooked up the ComfortTile radiant heating system it was amazing how evenly and effectively the system produced heat. It will be a pleasant living environment for our customers to wake up to. I will be recommending your product on all of my jobs,” said Dan Zeigler, Superintendent of Bartran Construction, Inc. The goal of the construction team was to build a home with elegance and tranquility, and was reminiscent of the charm of Northern Italy. Warmzone was the perfect compliment to the great features such as a chef’s center, butler’s pantry, a grand hall that accesses the gallery, and 2,000 sq. feet of outdoor living. The master suite includes a relaxation room that opens into a morning loggia, where the radiant floor heating was installed. No house claiming to be inspired by Italy can be complete without a wine cellar, wine tasting room, and wet bar. The discovery of the superior comfort of under-floor heat has long since found popularity in European countries. More and more people in the United States seeking the same quality of living are modeling their homes with a European flare. Installing radiant floor heat is the simplest and quickest way to get there, especially for the remodel of existing homes. Warmzone will be there every step of the way, and offers full support, including a network of qualified installers across the country. Warmzone and warmzone.com are registered marks and are the property of their respective owners. April 15, 2008 – Making a good thing better, Warmzone is adding to its most popular line of radiant heat products to reach an even wider range of users and radiant heat applications. The In-Slab floor heating system is now available for indoor radiant heating in both residential and commercial settings. The In-Slab floor heating system can be lower in cost than the popular CT system, making radiant heating accessible to more people for their building projects. The In-Slab heating cable and radiant heat system works best in new concrete construction and can be installed under any flooring in both wet and dry environments. In-Slab radiant heating cable offers great features such as: durability, energy efficiency, a 10-year manufacturer warranty, safety approved, and versatility for rooms or walkways of any size and shape. The In-Slab system can be installed by any competent do-it-yourselfer, or by a preferred Warmzone installer in your area. (However, be sure to have a licensed electrician wire the system.) The In-Slab radiant heat system is controlled by a thermostat with a built-in GFCI and in-floor sensor. The thermostat also has a built-in clock that allows you to program up to four events per day, with the option to manually change for a single event. Electric radiant heating systems have been gaining popularity throughout Northern America, and many upscale resorts are installing radiant heat to entice customers seeking luxury amenities. Radiant heat is no longer thought of as only a luxury, but as an efficient means to heat homes or work spaces without the use of fossil fuels. The benefits of electric radiant heat extend far beyond added comfort, providing home owners and businesses a green alternative heating solution. Pouring concrete in cold weather is usually not a good idea. Even with the arrival of warmer temperatures, the ground can still remain frozen in many parts of the country. Typically, this means that construction projects involving concrete must wait until the ground thaws. 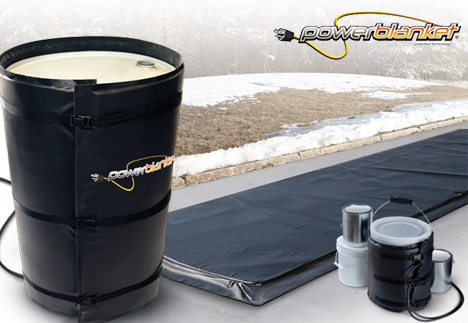 The Powerblanket® is an ideal solution to pouring concrete in cold weather. Electrically-heated Powerblankets are extremely durable, weatherproof concrete curing blankets for home and construction projects. From large outdoor projects to small indoor needs, versatile Powerblankets are available in a variety of sizes and designed to link together to fit the specific space requirements of your projects. Most people try to use blankets or straw to keep concrete from freezing in cold weather. However just keeping the concrete from freezing isn’t enough. “No amount of blankets or straw will thaw frozen ground — and the last thing you want to do is pour concrete on frozen ground,” noted Warmzone National Sales Manager, Bryan Morris. While it may be possible able to trap in some heat, this insulation won’t keep the temperature at an ideal level for maximum curing efficiency. “To pour concrete you need to have the temperature between 65 – 85° Fahrenheit – both to lay a strong foundation and to save hours and hours of time. Powerblanket is a solution,” Morris added. The durable blankets are also energy efficient. The rugged Powerblanket is safe to handle in inclement weather and is extremely durable. The insulated, vinyl covered blankets can be driven on, pulled over re-bar, dragged through mud and water, buried, and then rolled up or folded until it is needed again. Powerblankets can be a tremendous asset to contractors and do-it-yourselfers by preventing construction delays as well as enhancing the quality of cement work. The applications of the Powerblanket are virtually limitless.